Piyush Goyal’s interim budget speech was deafeningly silent on the government’s performance on jobs. It’s a remarkable ostrich-like approach. Just because you bury your head in the sand, the problem doesn’t go away. After the farm crisis and the Rafale deal, it is jobs or rather joblessness that has been the issue of big debate. 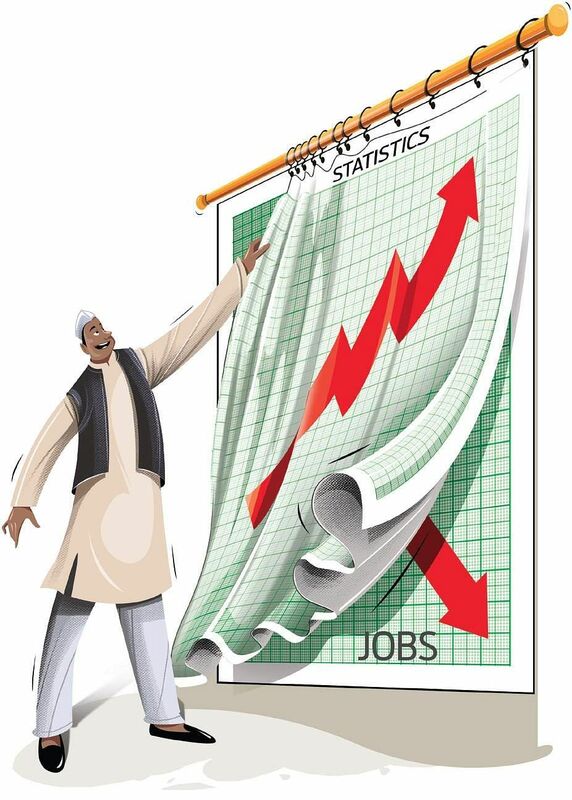 It has been spurred in recent days by the leaking of the National Sample Survey Office (NSSO) report, which shows that the country’s unemployment rate has hit a 45-year high at 6.1 per cent in 2017-18. A connection has been drawn to the crippling effect of demonetisation in November 2016, when thousands of small units shut down, and lakhs were thrown out of work. It’s one thing for the government to be grappling with a bad situation; but when people suspect you are meddling with statistics to show yourself in better light, then we are hitting a raw nerve. One wonders what the violent protests and shooting of six farmers on June 6, 2017, was all about in Mandsaur, Madhya Pradesh? They were protesting against low crop prices and loan burdens. It may not have been a jobs agitation, but certainly one about underemployment and lack of income! There is also a deadpan denial by Minister of Statistics, Sadananda Gowda. He told the Lok Sabha there was no such NSSO “report” and the government was still processing the figures. “What you are citing is a fake report,” he told critics of the government. But the government version is not washing anymore. NSSO data shows that the open unemployment rate (as differentiated from the disguised employment or underemployment rate) is not only the highest since 1972-73; it is also the highest jump. While the open unemployment rate was never over 2.6 per cent between 1977-78 and 2011-12, it has now jumped to 6.1 per cent in 2017-18. As education spread, the employment situation became worse, not better. It reduced the farm jobs sector for the first time since independence, as the educated youth turned to looking for urban and services jobs. The growing number of educated youths (aged 15-29) who are ‘Not in Employment, Education and Training (NEET)’, grew by about 5 million per annum, and their absolute numbers have gone up from 70 million in 2004 to 116 million by 2018. With the slowdown, manufacturing jobs actually fell in absolute terms from 58.9 million in 2011-12 to 48.3 million in 2015-16, a massive erosion of over 10 million jobs over a mere four-year period. Looking at the job crisis, more than the open unemployment figures, it is the underemployment that is the bigger problem. Anecdotal evidence shows that the educated are employed at jobs far below their qualifications. A recent advertisement for the post of 14 sanitary workers in Tamil Nadu secretariat attracted 4,000 applications, and these included a large number of engineers and MBA graduates.Goutam Das, in his book Jobonomics, estimates that India would have as many as 20 crore underemployed people with ‘bad jobs’ or no jobs by 2025. “Indeed, unemployment is the lesser of India’s problems. The more serious problem, instead, is severe underemployment,” NITI Aayog said in its three-year action agenda for 2017-18 to 2019-20. “What is needed is the creation of high-productivity, high-wage jobs,” the Aayog added. Unfortunately, the various Modi programmes including ‘Make in India’, ‘Start-Up India’ and ‘Digital India’, which were to drive growth in the new economy, never happened. But Narendra Modi believes the truth is the very opposite. In possibly his last speech in the current Lok Sabha, the Prime Minister has pointed to Employees Provident Fund Office numbers having increased by 180 million and registrations with the National Pension Scheme having doubled from 6.5 million in 2014 to 12 million by October 2018. If one does not recognise there is a problem, how does one tackle it?